WELSAT tailors unique tours for special groups by request. These tours are offered only to members of that group. Please fill-in and submit the form below to book. A full day visit to the world-famous Inca citadel of Machu Picchu, departing Urubamba in the early morning to reach Aguas Calientes town after a 1 1/2 hours train ride. From this point, a bus will take us up to the ruins to start a fully guided tour of the Inca city lasting between 2-3 hours, after which you will enjoy free time to further visit this impressive archaeological site. In the afternoon, bus ride back to Aguas Calientes to board the train that will take us back to Ollantaytambo and your hotel in the Sacred Valley. This Special Tour is a full day tour, from 6 am to 8 pm. 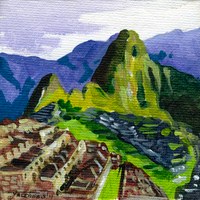 For Huayna Picchu, please make a special request, in advance. It is IMPORTANT to bring a raincoat, especially in the rainy season, (December to March), and a hat and sunscreen year-round. Meals are NOT included, unless otherwise specified.